Our scientists and managers depend on research surveys to monitor the status and trends of the coral reef ecosystems across the Hawaiian Archipelago over time. Coral reefs around the globe, including Hawaiʻi, are threatened by climate change, disease, land-based sources of pollution, and unsustainable fishing practices. During expeditions this spring and summer, teams of scientific divers from NOAA’s Pacific Reef Assessment and Monitoring Program will assess reef fish and corals in the context of changing environmental conditions. They will collect images of the ocean floor to create 3D models of the reefs. The abundance and distribution of reef fish and coral reef organisms are used to characterize the conditions and integrity of our coral reef ecosystems. Over time, we can see how they have changed—an important part of managing and conserving reef-associated life in the region. This expedition marks the 20th anniversary of the Pacific Reef Assessment and Monitoring Program’s inception in 2000, and will be conducted using the NOAA Ships Oscar Elton Sette and Rainier. We will add our research this season to collections from baseline monitoring surveys across the Pacific and in Hawaiʻi in 2000, 2001, 2002, 2003, 2004, 2005, 2006, 2008, 2010, 2013, and 2016. The Sette will survey the main Hawaiian Islands: Kauaʻi, Niʻihau, Maui, Lānaʻi, Molokaʻi, Kahoʻolawe, Oʻahu, and the island of Hawaiʻi. The Rainier will survey portions of the Papahānaumokuākea Marine National Monument in the remote Northwestern Hawaiian Islands: French Frigate Shoals, Lisianski/Neva Shoals, Pearl, and Hermes Atoll, and Kure Atoll. At each site, the ships will deploy small boats to reach study areas, including locations along the leeward and windward exposures, near the channels between islands, and in forereefs, backreefs, and lagoons. Of particular note, our researchers are fortunate to return to the protected island of Kahoʻolawe, where few people have access. Kahoʻolawe was once a bombing range for the U.S. Navy, and it is now an island reserve under the state of Hawaiʻi. Following our initial visit in 2016, this expedition is the second time that our program will survey the reef systems of Kahoʻolawe. Those surveys found that the reefs in certain areas were in good condition, and roving predators such as jacks were abundant when compared with other sites around the main Hawaiian Islands. As the threats to coral reefs and marine ecosystems grow, our researchers lean more heavily on digital imaging to increase our monitoring capabilities. We create a mosaic (2D) and 3D model of an area using structure from motion, a photogrammetry technique (mapping using the distance between objects). It estimates 3D structures by aligning 100s to 1000s of overlapping images. Combining seafloor images to create 3D models of large areas of reef tract is a process called “structure-from-motion” photogrammetry, which is a new effort for our program. During this mission, we will conduct structure-from-motion surveys across the archipelago to measure the density, surface area, partial mortality, and health of corals. Our team will conduct structure-from-motion surveys at fixed stations to assess the growth, mortality, and recruitment of individual coral colonies, which will provide valuable information on the resilience of coral reefs to local and global threats. Scientists aboard the Sette and Rainier will measure water temperature, salinity, carbonate chemistry, and other physical characteristics of the coral reef environment with an assortment of oceanographic monitoring instruments. Researchers will assess the potential early effects of ocean acidification on coral reef growth with calcification accretion units and bioerosion monitoring units. November 13, 2018 — A team of divers hauled in nearly 165,000 pounds (75,000 kilograms) of abandoned fishing nets and plastic waste during a cleanup expedition at Papahanaumokuakea Marine National Monument, federal officials said. The 18 divers left Sept. 19 and returned Oct. 29 from a trek to the chain of isles and atolls located 1,200 miles (1,931 kilometers) northwest of the main Hawaiian islands, according to the National Oceanic and Atmospheric Administration, which runs the expeditions. The divers hauled in about 82 tons (74 metric tons), which is comparable to the weight of 45 mid-sized cars or one space shuttle, NOAA said. The team of divers from NOAA Fisheries and University of Hawaii’s Joint Institute of Marine and Atmospheric Research sorted out the debris Friday. The group split the debris into categories such as plastic laundry baskets, fishing nets, tires, buoys and smaller personal-care items such as plastic toothbrushes and combs. Papahanaumokuakea Marine National Monument is uninhabited by humans. But due to its central location in the system of circulating currents called the North Pacific Gyre, the debris has been carried by currents to its shores for decades. NOAA’s marine debris team has been going on expeditions to the Northwestern Hawaiian Islands almost yearly to survey and remove litter since 1996. Cumulatively, including the last mission, teams have collected about 2 million pounds (0.91 million kilograms) of debris. The litter does ecological damage at Papahanaumokuakea, said NOAA’s Kevin O’Brien, who served as chief scientist for the mission this year. November 12, 2018 — Stretching 1,200 miles northwest of the main Hawaiian Islands, a chain of remote islands and atolls known as the Northwestern Hawaiian Islands are hundreds of miles from the nearest human populations. Yet, these beautiful coral reefs and uninhabited shorelines are centrally located in the North Pacific Gyre, where currents gather marine debris from all around the Pacific Ocean. October 5, 2018 — The National Oceanic and Atmospheric Administration’s research ship Hi‘ialakai has taken seven NOAA field biologists away from French Frigate Shoals ahead of Hurricane Walaka, which is approaching Papahanaumokuakea Marine National Monument today. The field crew of three green sea turtle biologists and four monk seal biologists was not scheduled to leave French Frigate Shoals until mid-October, said Megan Nagel, spokeswoman for the U.S. Fish and Wildlife Service — Pacific Region. On Monday, a U.S. Coast Guard crew flew a HC-130 Hercules from Air Station Barbers Point to Johnston Atoll and evacuated four U.S. Fish and Wildlife Service biology field workers from the wildlife refuge. Hurricane Walaka was a Category 4 storm with sustained winds of 130 mph when it passed the tiny four-island atoll Tuesday. June 18, 2018 — The U.S. Senate Appropriations Committee this week passed the Commerce, Science, and Justice Appropriations Bill for fiscal year 2019. U.S. Sen. Brian Schatz (D-Hawaii) worked to include $1 million to preserve Papahanaumokuakea Marine National Monument, more than $36 million to improve tsunami warnings, and nearly $30 million to protect coral reefs in Hawaii and across the country. $1 million for Papahanaumokuakea Marine National Monument. The bill authorizes NOAA to make a competitive grant of up to $1 million for research and management activities in Papahanaumokuakea. The funding is subject to a 100 percent non-federal match, and will bring new resources to keep our Hawaiian archipelago healthy and productive. $31.6 million for the NOAA Tsunami Program. The program provides funding to coastal states for preparedness activities such as inundation mapping, disaster planning, and tsunami education. Despite deep cuts proposed by President Trump, Senator Schatz helped protect funding for this critical program. November 22, 2017 — Republican House members are urging President Trump to “think big” in his ongoing review of 27 national monuments, including opening up the Papahanaumokuakea Marine National Monument not just to commercial fishing — but to oil, gas and mineral exploration. The Trump administration has been pondering the future of the monuments for months, with a final announcement expected in December. The proposal to open Papahanaumokuakea to commercial uses came in a Nov. 9 letter from a group of 24 Republicans who are active in the western caucus. The letter writers want the boundaries of three of the four Pacific reserves — Pacific Remote Islands, Rose Atoll and Papahanaumokuakea — to be reduced in size and fishing restrictions to be lifted in all of the reserves. But they only mentioned the possibility of energy extraction for Papahanaumokuakea and the Pacific Remote Islands reserve. He said the only possible resource of that kind is something known as “manganese nodules,” metallic minerals found in rock-like formations in deep water on the seabed. But Aila said that it is so costly and difficult to obtain minerals in such remote locations that it is more “futuristic” than a viable economic opportunity. WASHINGTON (Saving Seafood) – September 26, 2017 – Members of Saving Seafood’s National Coalition for Fishing Communities testified this morning at a hearing of the House Natural Resources Subcommittee on Water, Power and Oceans on four bills that would modify federal fisheries management. Jon Mitchell, mayor of the nation’s top-grossing fishing port New Bedford, Massachusetts and head of the New Bedford Harbor Development Commission, and Mike Merrifield, Fish Section Chairman of the Southeastern Fisheries Association (SFA) testified on the needs of commercial fishermen and reforms they would like to see to the Magnuson-Stevens Act. 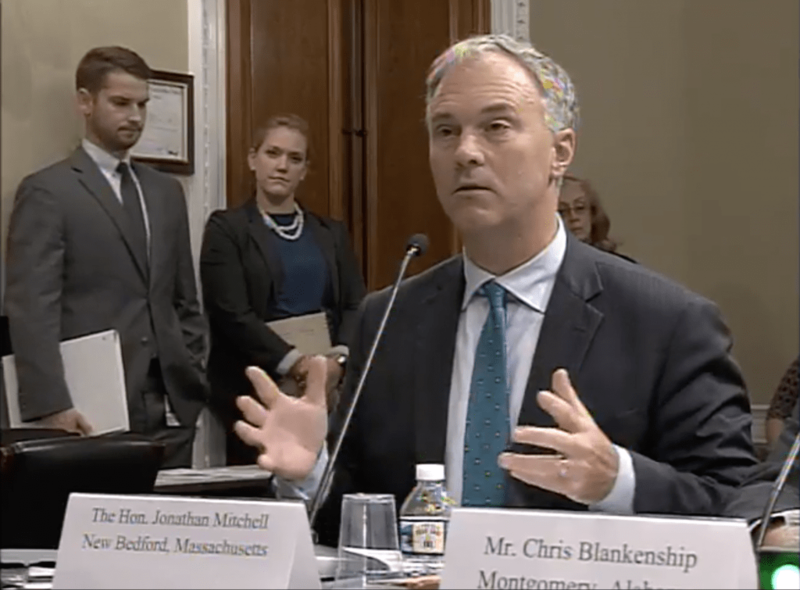 Mayor Mitchell and Mr. Merrifield were joined by several other witnesses, including Assistant Administrator for NOAA Fisheries Chris Oliver, who testified on the reauthorization of the Magnuson-Stevens Act and the possibility of allowing additional flexibility in stock rebuilding. Earlier this year, commercial fishermen from around the country united to support Mr. Oliver’s appointment to NOAA. At this morning’s hearing, the subcommittee considered two bills to amend and reauthorize the Magnuson-Stevens Act, as well as bills that would alter recreational fisheries and red snapper management. While Mayor Mitchell called the Magnuson-Stevens Act “generally speaking…a success story” that has helped make America’s fisheries “at once among the world’s largest and most sustainable,” he called for more flexibility in fisheries management to allow fishermen to catch their full scientifically justified quota. In particular, he criticized the ten-year rebuilding requirement for overfished stocks. The mayor was also critical of the Antiquities Act, by which presidents can designate large national monuments with little or no input from scientists and local stakeholders. The Act was recently used to create and enlarge several marine monuments, including the Northeast Canyons and Seamounts Marine National Monument in New England and the Papahānaumokuākea Marine National Monument in Hawaii. Mr. Merrifield voiced skepticism of efforts to shift federally managed species over to state management, saying that states manage many fisheries in such a way that recreational fishermen get most or, in some cases, all of the fish. Mr. Merrifield also testified about the SFA’s strong opposition to the RED SNAPPER Act, introduced by Rep. Garret Graves of Louisiana, which would give states more authority over red snapper management. August 21, 2017 — As Interior Secretary Ryan Zinke approaches the 24 August deadline for his recommendations to President Donald Trump on whether to alter dozens of national monuments, conservation proponents say it remains all but impossible to predict which sites the administration could target for reductions or even wholesale elimination. In recent months, Zinke has traveled from coast to coast as he conducted the review, which included 27 national monuments created since 1996, the majority of which are larger than 100,000 acres. Obama created the first Atlantic marine monument in 2016 when he designated nearly 5,000 square miles for preservation off the coast of Massachusetts. But the decision — which barred oil and gas exploration in the area and restricted commercial fishing — drew a lawsuit from Northeastern fishermen, including the Massachusetts Lobstermen’s Association, Atlantic Offshore Lobstermen’s Association, Long Island Commercial Fishing Association, Rhode Island Fishermen’s Alliance and Garden State Seafood Association. The case is pending in the U.S. District Court for the District of Columbia, but a judge stayed action in the case in May to await the outcome of the Trump administration’s reviews (E&E News PM, May 12). During his visit to the East Coast in June, Zinke stopped in Boston to meet with both fishermen’s groups and scientists about the monument. The Boston Globe reported that Zinke appeared sympathetic while meeting with about 20 representatives of New England’s seafood industry. This site near Hawaii is the world’s largest marine protected area at nearly 600,000 square miles. Bush first designated the site — originally named the Northwestern Hawaiian Islands Marine National Monument — in 2006, then renamed it to Papahānaumokuākea in early 2007 in honor of Hawaiian gods Papahānaumoku and Wākea, whose mythology includes the creation of the Hawaiian archipelago and its people. In 2016, Obama opted to quadruple the site’s size to protect the 7,000 species that live in the monument’s boundaries, as well as to extend prohibitions on commercial fishing and extractive activities (E&E Daily, Aug. 26, 2016). The Trump administration could opt to try to roll back those prohibitions as well as the monument’s size. Established by the Magnuson-Stevens Fishery Conservation and Management Acts of 1976 and 1996, WESPAC is charged with reporting its recommendations for preventing overfishing and protecting fish stocks and habitat to the Commerce Department. While WESPAC International Fisheries Enforcement and National Environmental Policy Act coordinator Eric Kingma believe that WESPAC’s communications with the president fall within the agency’s purview of advising the executive branch, others, including Earthjustice attorney Paul Achitoff, consider the comments an illegal “lobby to expand WESPAC turf” and shape public policy. WESPAC argues that monument expansion hampers longline fishermen from feeding Hawaii, which imports roughly 60 percent of the fish it eats. Pro-expansion groups such as Expand Papahanaumokuakea point out that only 5 percent of longliner take came from the monument; that longliners have recently reached their quota by summer, then resorted to buying unused blocks from other fleets; and that much of the longliners’ take, including sashimi-grade bigeye tuna, is sold at auction to the mainland U.S., as well as to Japanese and other foreign buyers. The bigeye tuna catch, moreover, has been trending upward every year since the first year of logbook monitoring in 1991. In 2014, the Hawaii longline fleet caught a record 216,897 bigeye tuna, up 12 percent from 2013. April 28, 2017 — President Trump’s call to review 24 national monuments established by three former presidents puts in limbo protections on large swaths of land that are home to ancient cliff dwellings, towering sequoias, deep canyons and ocean habitats where seals, whales and sea turtles roam. The designation closed the area to commercial fishermen. This remote monument northwest of Hawaii’s main islands was created by President George W. Bush in 2006 and was quadrupled in size last year by President Obama. The nearly 583,000-square-mile safe zone for tuna, the endangered Hawaiian monk seal and thousands of other species is the world’s largest marine protected area, more than twice the size of Texas. Obama pointed to the zone’s diverse ecology and cultural significance to Native Hawaiian and early Polynesian culture as reasons for expanding the monument.